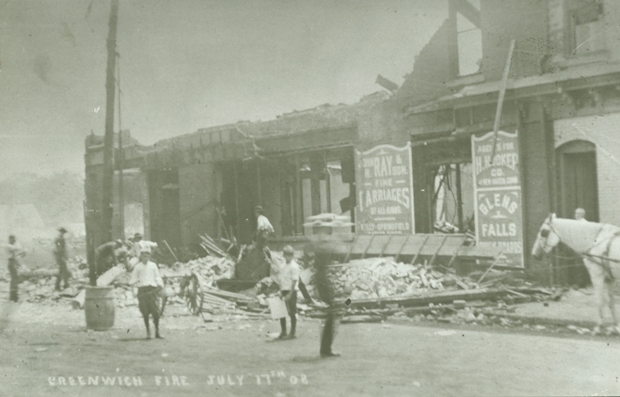 On July 17, 1908, the day following the White Mountain Express train wreck, the most disastrous fire on Greenwich Avenue since 1900 broke out. While the building was burning, Miss Clara Talbot, chief telephone operator, and Miss Alice Gronold, assistant, continued to send messages for help until the intense heat and stinging smoke forced them to leave. Before closing down, shutting the town off from all telephone communications, they sent alarm calls to nearby cities and towns. They had just enough time to escape. Greenwich firefighters were assisted by the Port Chester, East Port Chester (now Byram), Stamford, Rye, Glenville, and Mianus fire companies. The Police Patrol of both Greenwich and Port Chester spread tarpaulins and saved hundreds of dollars of stock in stores from water, then stayed to guard it from theft. 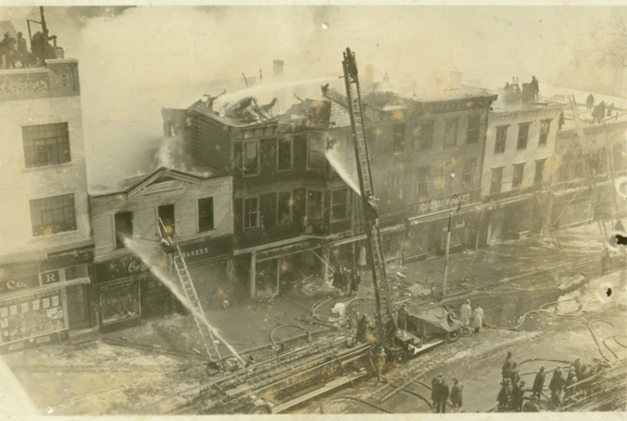 After the fire the Warden and Burgesses of the Borough passed an ordinance requiring buildings within 200 feet of Greenwich Avenue be fireproof or semi-fireproof. In addition, a resolution was passed that a sum of $3,000 (over $70,000 today) be appropriated for the purchase of new fire hose to replace a hose that had burst and $2,000 (over $45,000 today) toward the purchase of a chemical automobile fire engine. 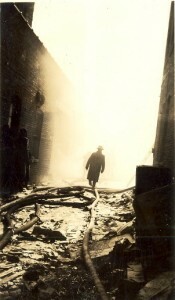 The smell of smoke on February 22, 1936, warned of the fire. A woman telephoned the Amogerone fire station and simultaneously a man rang the alarm from a Gamewell fire alarm box. Frost in the siren caused the alarm system to fail. Fire Chief Hubbard ran to the top of the 1882 bell tower and rang the bell by hand to summon volunteers and the six paid firefighters; neighboring communities were phoned for assistance. You can’t work men in a fire without the protection of waterproofed gloves, helmets and boots…Why one man’s hand was frozen because he lacked the proper gloves! Where did he work? At the top of the aerial ladder forty-five feet above the ground…Many of the volunteers worked in their own clothes, not properly protected against the icy water, the cold, the fire, the smoke. When their water soaked clothing froze they would go home, change and return for more. The Greenwich Water Company diverted 600,000 gallons of water from its filtration plant in north Greenwich. Police Chief Patrick Flanagan detailed 40 Greenwich policemen to hold back the growing crowds, patrol the fire area, and protect stores from looting. They were aided by the voluntary assistance of 10 policemen from Stamford. Greenwich fire police were assisted by East Port Chester fire police. The Red Cross sent their brand new canteen car and helped the 25 families whose homes were lost. Today the estimated loss would be between $2 and $3 million dollars. In February 1936 the Board of Selectmen recommended “the appointment of a paid fire chief who shall have charge of all fire departments within the town, the appointment of a 15-man force to be on duty at all times in the Central Fire Station, installation of an automatic fire alarm system to be housed in the Central Fire Station.” In addition $45,000 (over $700,000 today) was approved for the purchase of property between Town Hall and Mason Street for the Central Fire Station; a month later it was decided this building should be a combined fire and police station. 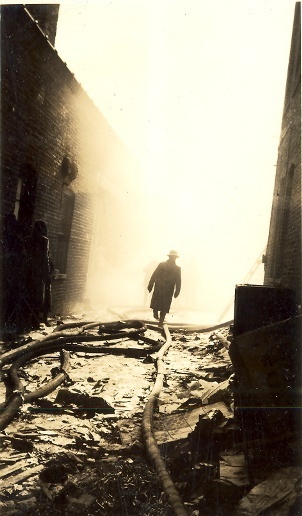 In February 1938, Stuart M. Potter was appointed to the position of chief of the town’s fire departments; in January 1939 the Central Fire-Police Station on Havemeyer Place was opened.